Congress Thinks Voters Are Way More Conservative Than They Actually Are. Here’s Why. For a few years now, political scientists have been learning what America’s cantankerous uncles have always known: Those dang politicians are way out of touch. In 2013, researchers from Northwestern University and Stanford found that state legislators throughout the U.S. wildly overestimated the conservatism of their constituents. Republicans were more liable to have a deluded sense of how many of their voters’ wanted to abolish the welfare state, but even Democrats had a tendency to look at their blue districts and see purple or red: On average, legislators from both parties underestimated the level of support for universal health care in their districts by more than 15 percentage points. 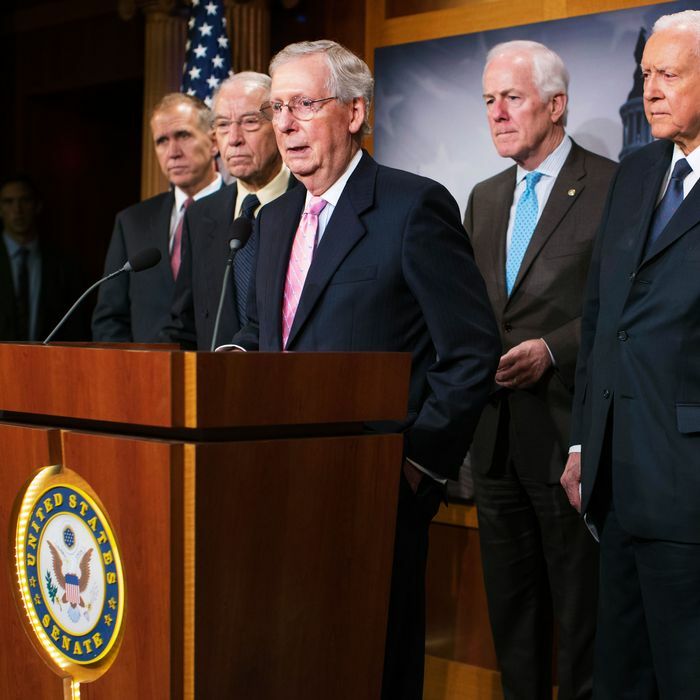 Now, a new study finds that members of Congress also believe that they represent staunchly conservative electorates that do not actually exist. In August 2016, political scientists from the University of California and Columbia sent a survey to every House and Senate office’s top legislative staffers — which is to say, to the wonks who, in the paper’s phrasing, are responsible for “connecting the preferences of constituents with Members of Congress.” In it, they asked the policy professionals to estimate their constituents’ level of support for repealing Obamacare, regulating carbon dioxide, making a $305 billion investment in infrastructure, mandating universal background checks for firearm purchases, and raising the federal minimum wage to $12 an hour. [I]f we took a group of people who reflected the makeup of America and asked them whether they supported background checks for gun sales, nine out of 10 would say yes. But congressional aides guessed as few as one in 10 citizens in their district or state favored the policy. Shockingly, 92 percent of the staff members we surveyed underestimated support in their district or state for background checks, including all Republican aides and over 85 percent of Democratic aides. The same is true for the four other issues we looked at: regulating carbon emissions to address the climate crisis, repealing the Affordable Care Act, raising the federal minimum wage and investing in infrastructure. On climate change, the average aide thought only a minority of his or her district wanted action, when in truth a majority supported regulating carbon. But this is an unduly generous interpretation of Congress’s intentions — or, at least, of the congressional GOP’s. When House Republicans from swing districts voted to repeal and replace the Affordable Care Act last year, they knew full well that it was not what their constituents wanted. When a bill polls worse at the national level than any other piece of major legislation that’s come before Congress in three decades, you don’t need district-level data to know it isn’t popular with your voters. And in its 2018 messaging, the GOP has made its awareness of the discrepancy between its priorities for health-care policy, and those of its voters, perfectly clear: Republican lawmakers who are actively trying to repeal Obamacare’s cap on how much insurance companies can charge people with preexisting conditions for their coverage are spending millions of dollars on TV ads that assure voters they would never do such a thing. Similarly, we know that Republicans did not write a tax bill that favored the rich over the middle class because they mistakenly believed that this was what voters wanted. Were that the case, the president and his advisers would not have assured the public, in September 2017, that the rich would gain nothing from the Republican tax plan. 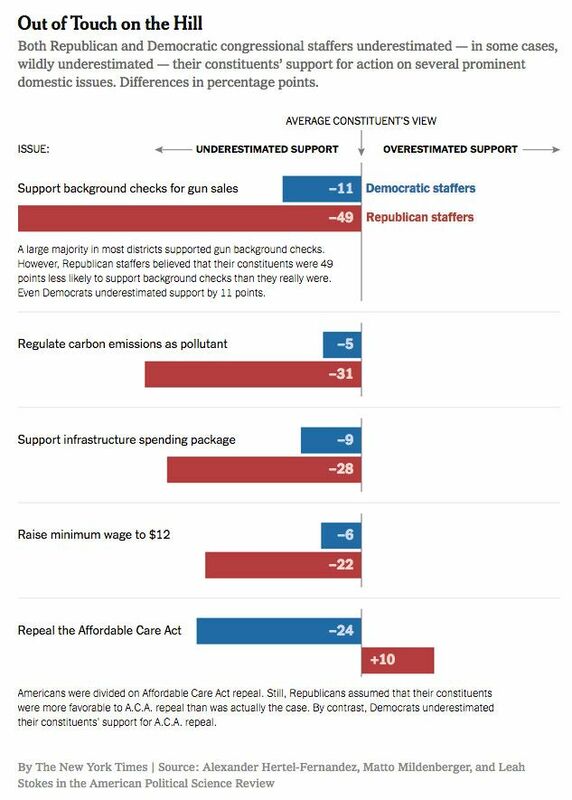 This isn’t to say that congressional Republicans do not earnestly overestimate their voters’ conservatism on other issues. The staffers who took the researchers’ survey had little incentive to lie. But, by all appearances, they also have little incentive to know — or care — what their constituents actually think about fiscal and regulatory policy. If there were a big, electoral price for overestimating the conservatism of one’s constituents, then elected representatives at every level of government would not be doing so. Rather, there appears to be an advantage to deluding yourself about how right wing your constituents are on most issues. That way, you can do right by the interest groups who actually have the power to make or break your reelection, while telling yourself that you’re faithfully serving the popular will. All of which is to say: Congress might be less confused about what its constituents truly want than political scientists are about who, in practice, Congress’s constituents truly are.